As a fairly new member of the floral world, being shown Pinterest images of what a bride envisions of their wedding are always extremely helpful, but do tend to become a little repetitive. For the Duncan's, it went a little different. Given a bride's favorite flower and a wedding color pallette, we were free to make the Duncan wedding a success! This instantly gave me both a feeling of excitement and nervousness; endless combinations come to mind thinking about her blush pink and white colors along with her favorite flower- the daisy. The bouquet style was easy as well, as hand-tied bouquets are our favorite to do and are perfect for tying in a refined style to an outdoor, rustic wedding. We worked with a local flower grower (Johnson Creek Farms) to bring in a variety of daisies, along with one of our wholesalers to bring us the perfect blush pink roses (The Nena). I especially loved using the variety of daisies we got- wild, "crazy" and daisy mums. Roses are always perfect for weddings, due to their diversity in color, and for their resistance to wilting as quickly as other flowers might when outdoors. Instead of choosing the oh-so-popular narrow Seeded Eucalyptus, we chose to round out the bouquets with a wider version (Super popular as well: Silver Dollar Eucalyptus). Since the Bride absolutely loved daisies, we also kept the idea going when it came to filler for them, choosing to use tiny daisies along with Wax flower to add structure; we then added a final filler of Baby's Breath to tie in the ceremony as well as reception decoration. My overall favorite thing to create for this wedding were the boutonnieres. To be fair, they are always my favorite thing to make but this one was a little more fun due to the Daisies we used. Simplicity is what had these boutonnieres going for them along with making the daisies pop against the groomsmen's jackets. We chose to use leatherleaf as the greenery and Wax as filler to make the daisy stand out, then twine-wrapped them. Overall, this wedding turned out perfect! It showed simplicity can be absolutely beautiful- no matter the circumstances! For this wedding, we created 8 Bridesmaid's bouquets (that's a killer Bride Tribe right there), a bridal bouquet, matching groomsmen bouts as well as loose flowers for the ceremony and reception space. 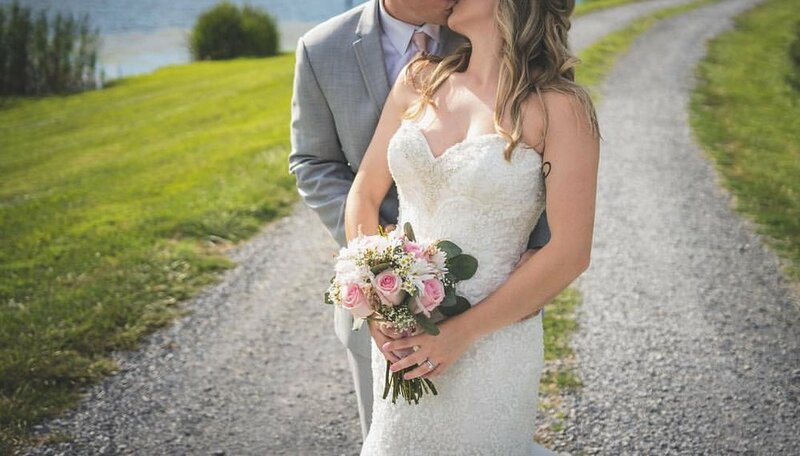 We delivered the flowers to an absolutely stunning venue at Old Mill Farm in Bedford, VA!